Queen Victoria's kitchen on the royal train, 1869. 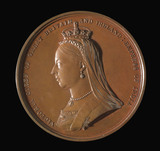 Queen Victoria, International Medical Congress medal, London, 1881. Queen Victoria's royal saloon, 1869. Queen Victoria's lavatory on the royal train, 1869. Sleigh built for Queen Victoria, 1850-1870. Queen Victoria and family departing to Scotland, 19th century.